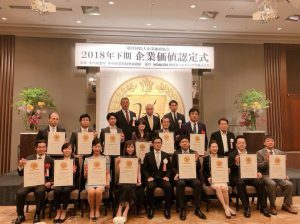 👘Our Store – AIWAFUKU has awarded the "Corporate Value Determination" of the Corporate Value Association. 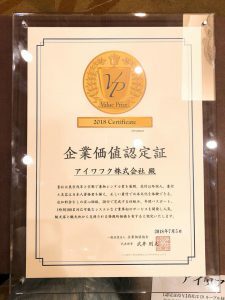 And, we are the first shop of kimono rental service to get this award. 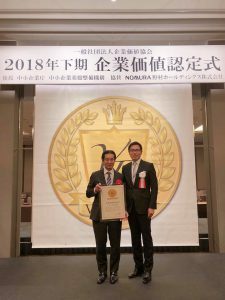 To service foreign tourist to wear kimono by professional who has certified by technician for beauty, and let tourist experience Japan culture exactly. The price is included all the service. The customers should not pay other money. It takes about 30 minutes to dress up. 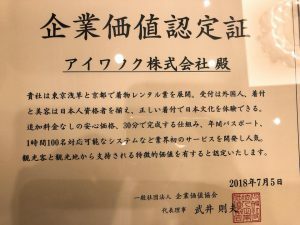 We participate the activities about Kimono Passport, and we are the first shop to use new service system which can accept 100 costumer's reservation in 1 hour. Support from tourist and the value of local culture let us earn recognition. From now on, KYOTO AIWAFUKU, ASAKUSA AIWAFUKU will service love and high value service to costumer, people in Japan and staff.